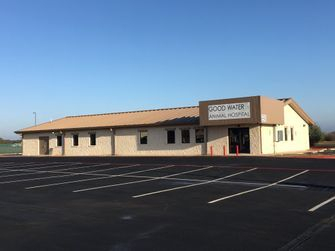 Good Water Animal Hospital is a full service veterinary hospital serving Georgetown and Sun City, Texas. We are conveniently located just west of Sun City, in Georgetown, Texas next to the Dollar General store, at 6590 S. Lakewood Dr. Click here for a map and driving directions. 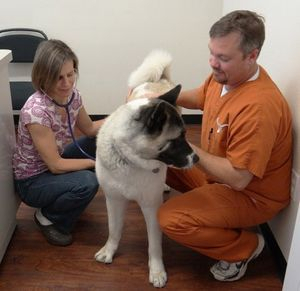 We provide a full range of veterinary services including vaccinations, exams, dentistry, and surgery. Dr. Stephanie Webb and her staff at Good Water Animal Hospital believe love is a four-legged word, and we look forward to providing excellent care for your pets. Visit our client testimonials page for more information about the quality of care we provide, and visit our staff page for more information about Dr. Webb and her team. Our staff!! From left to right. A graduate of Texas A&M College of Veterinary Medicine, Dr. Sheih brings 17 years of experience to Good Water Animal Hospital. After hours emergencies click here. Adopting from the Georgetown Animal Shelter or the Williamson County Animal Shelter?